Product prices and availability are accurate as of 2019-04-14 12:11:30 BST and are subject to change. Any price and availability information displayed on http://www.amazon.co.uk/ at the time of purchase will apply to the purchase of this product. The spirit of 181, the year of the distillery's founding, lives on in every precious drop of our magnificent 21 year old single malt. It is a wonderful and exclusive addition to the Jura family, embracing many of the characteristics of our 2th anniversary bottling. Vintage casks have given this spirit a flawless finish of soft marzipan, crushed walnuts and bitter chocolate. The palate is further rewarded with whispers of succulent maraschino cherries, citrus fruit and soft liquorice to complete this memorable masterpiece. Every precious drop of this whisky is a memorable masterpiece. 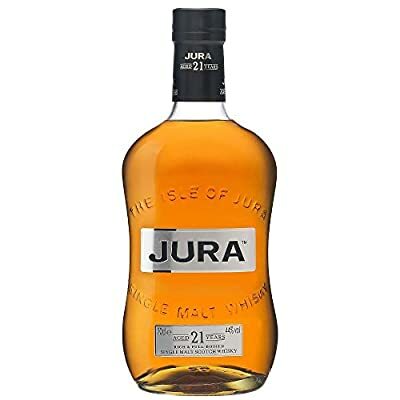 Matured in vintage casks, it has whispers of maraschino cherries, soft marzipan and liquorice, with hints of crushed walnuts and bitter chocolate for a rich, full bodied and flawless flavour. With the further flavour of citrus fruits cutting through, this is one memorable masterpiece.